Alicia speaks in Washington D.C. in February 2015. Women face obstacles and oppression worldwide. And yet, the struggle continues. Resilient and resolute — women across the globe are working to create meaningful change. This International Women’s Day, we’re launching a series of blogs through to Mother’s Day highlighting Women’s Voices of Cuba – a series exploring courageous women impacting Cuba. In December of 2014, the Obama Administration announced a historic opening with Cuba. Travel restrictions would be eased. Movement would be made towards normalized diplomatic relations. And three Cuban men being held in U.S.prisons were to be released. For Alicia Jrapko, lead organizer of International Committee for the Freedom of the Cuban Five, their release was the culmination of years of work. Alicia first moved to the United States in the 1970s, leaving behind a right-wing dictatorship in Argentina. “I came from the generation that wanted to change the world,” said Jrapko. It was that ethos which would drive her decisions in the years ahead. By the early ’90s, Alicia was drawn to the suffering inflicted on the nation of Cuba at the hands of the United States, including decades of economic embargo and subversion. She first traveled to the island in 1994, bringing humanitarian aid directly to the people of Cuba. It was through the course of this work that Alicia first became aware of the plight of the Cuban Five, and the glaring injustice of their imprisonment in the U.S.
Five Cuban intelligence agents, Gerardo Hernández, Antonio Guerrero, Ramón Labañino, Fernando González, and René González, were sent to the U.S. to infiltrate anti-Castro groups in the wake of numerous attacks on Cuban soil. In 1998, they were arrested, later convicted of charges of conspiracy to commit murder, conspiracy to commit espionage, and other crimes. Alicia was one of the few Americans present at their sentencing in 2001, and the unfairness of their prosecution was deeply impressed upon her. “I think that regardless of what people think about Cuba, those guys were unjustly imprisoned,” said Jrapko. 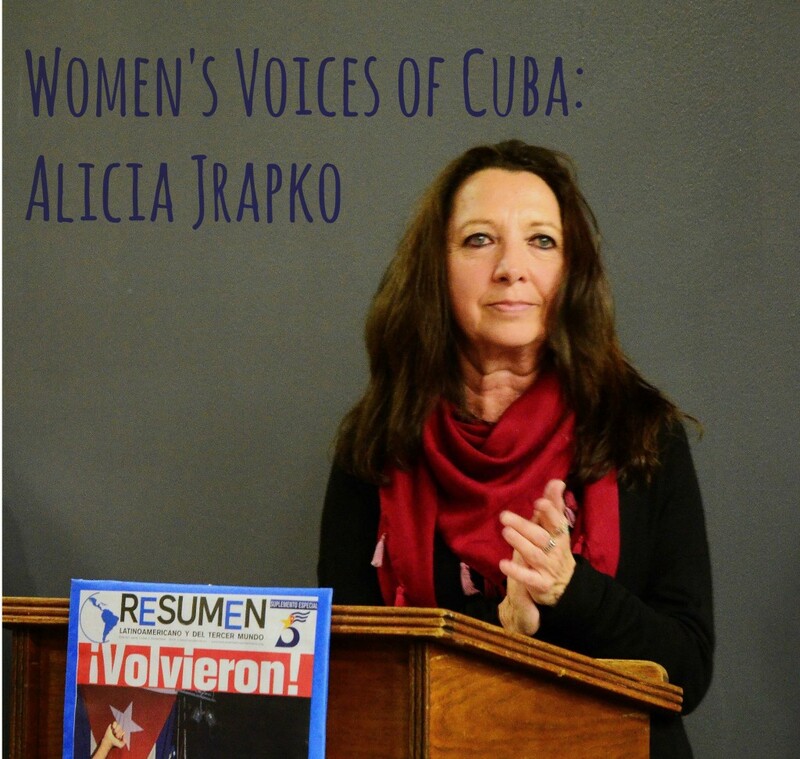 Working by day at an Oakland, California nonprofit, Alicia dedicated an increasing percentage of her time and energy to her work as the leader of the International Committee for the Freedom of the Cuban Five. Organizing conferences, convincing 13 U.S. mayors to sign letters in support of their release, generating international media attention — Alicia and the International Committee’s work played a critical role in generating grassroots support for the release of the Five. Along the way, Alicia drew strength from the family members of the Cuban Five, in particular the wives of the imprisoned men. In December of 2014, the improbable happy ending arrived. As part of a prisoner swap with the Cuban government, three of the Cuban Five members remaining in prison (two were previously released) were finally freed. But that doesn’t mean Alicia’s work is done. Fear and misinformation are still the norm for U.S. public perception — and more importantly, the United States still has a long way to go towards normalizing relations. “No reason for U.S. to try to change the regime when people in Cuba have decided what kind of system they want to have…The majority of people in U.S. are in favor of change in policy. I think that it’s important people learn about Cuba, and accept the reality, in fact – Cuba is an example. We could learn a lot from Cuba, and have many of the good things they have in Cuba here in this country,” said Jrapko. The Five are free, but Alicia Jrapko isn’t resting just yet. And we’re all quite glad she’s still at it.